To impact the lives of women in the greater Atlanta area by providing continuous growth opportunities for the whole person. The Airport Charter Chapter of the American Business Women's Association has modeled the vision of the National body to "bring together women of diverse backgrounds and to provide opportunities for them to help themselves and others grow..."
Our membership has run the gamut of professions: private industry, high finance, communication, education, real estate, medical, entrepreneurs, mortuary science, federal, state, local government, airline industry, retail, retirees and college students. We have 40 primary members. 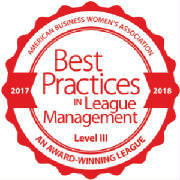 The Airport Charter Chapter was among the 2017-2018 Best Practices Award-winning Teams. Every year, the newly elected officers are charged with creating an annual plan to ensure the strength and vitality of their team and the perpetuation of the Association. ABWA's Beat Practices criteria serves as a blueprint for every team's success.